Cinda McDonald, RDH, CCLS, M.Ed. Cinda McDonald is a Certified Child Life Specialist working in the state of Texas. Cinda’s educational and professional background includes a bachelor’s degree in Psychology and Child Development, employment for six years as a child life specialist at Texas Scottish Rite Hospital for Children, and a master’s degree in Early Childhood Special Education. Cinda has also worked with Community Hospice of Texas, and she was a key player in two studies conducted by the Texas A&M Health Science Center exploring the use of child life in dentistry. At Texas Scottish Rite Hostpital, Cinda worked with a number of children suffering from JM. Here are some of the most common questions she has been asked by parents of children with JM. What is a Child Life Specialist and how can one help my child? A Child Life Specialist (CLS) is a non-medical person on the medical team. He/She holds a minimum of a Bachelors degree in Child Life, Child Development, Psychology, Human and Family Studies or another closely related field. Before practicing as a child life specialist, an internship of a minimum of 480 hours must be completed under the supervision of a certified child life specialist. After completing an internship, and holding the appropriate degree, the child life specialist is eligible to sit for the national certification examination, as provided by the Child Life Council. The main role of a CLS is to help relieve the stress and anxiety that children feel when they become patients; whether in a doctor/dentist office, hospital, emergency room, hospice or any other setting in which children are served. CLS’s have an extensive educational background and training in child development that enables them to relate to and communicate with children on the appropriate developmental level. 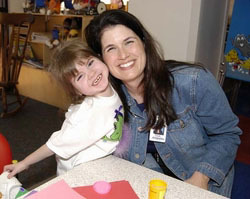 They often help the children that they serve by preparing them for procedures, surgeries, or hospital stays; teaching them coping techniques and strategies; providing distraction techniques during procedures; and offering comfort and support before, during and after procedures. During hospitalization, CLS’s work to make the environment as comfortable as possible by offering play activities to help familiarize children with medical equipment, and to help them just be a kid. They can also work with the child's siblings to help them better understand their brother or sister's condition. Upon request, many child life specialists also do school talks to help explain the child's medical condition to their classmates and teachers. My child has just been diagnosed with JM, and I don't know where to begin or how to explain this to him. What do I do? Your child knows something is going on and can feel that you are stressed so if possible, it would be better to tell him sooner rather than later. Children respond to this type of information differently than adults do. He may listen for a few minutes and then ask to go play. But later may come back and have more questions. He will likely repeat questions that he has already asked, several times, so be sure that your answers are consistent. Encourage him to ask questions at doctor visits and for questions that you can't answer, help him to write them down so that you can take them with you to the appointment. Understanding JM is difficult for an adult, so try not to provide so much information that your child is overwhelmed. He will likely continue to ask more questions as he grows older. But it is also important to know that whatever his age, he is listening to you and the doctors talk. So be mindful of what you say and how you say it when he is near. Try to maintain a positive attitude and keep your child's life as normal as possible. Maintain routines, household responsibilities, school attendance, and extracurricular activities as much as possible to maintain a sense of structure for your child. Although it seems like it would be easier to let things slide or to give in, children thrive on structure and routine in order to better understand their world, and their role in it. As a follow-up, I am so overwhelmed and can hardly talk about it myself, should I have a friend do it? Would it be better to wait and explain in a few weeks when I think I can do it without crying? If you do not feel that you can do that without becoming emotional, it would be beneficial for another trusted adult to offer the explanation. Child Life Specialists often help in explaining diagnoses to children through books, verbal explanations, drawing, videos, or medical play. If you aren’t working with a child life specialist, you and the person who will do the explanation should talk with the doctor or nurse about the best terminology to use when explaining the diagnosis to your child. When providing the explanation be sure to emphasize all the things that your child can still do and will be able to do in the future rather than things he can’t do. Is it better to spring a procedure on a child or to talk to them about it before? You should never, ever spring a procedure on a child. Even though the procedure may be painful or scary, it is important to let them know what is going on. This helps them to feel a little more in control. If you spring it on the child, he/she will always be looking over their shoulder waiting for it, or something even worse, to happen again. They will lose trust in you and any other people providing care to them as well as increase their stress and anxiety. Just be sure not to tell them to far in advance because that increases anxiety also. We are going to be in the hospital for my child to get a muscle biopsy soon. Do you have suggestions on how to talk to him about what will be happening? He has never been in the hospital before and is already afraid. Remember to be very positive when talking about the hospital and the muscle biopsy. Your child will look to you when deciding how scary it really sounds. I would first recommend that you ask your doctor if you can meet with their child life specialist prior to admission. The Child Life Specialist can work with you and your child, a day or two before admission, to prepare you for the hospital experience by taking you on a tour, showing you a video or even recommending books for you to read. He/She can also explain more about the surgical process. If you don't have access to a Child Life Specialist, you can find books about going to the hospital at your library, in a hospital Family Resource Center, or in an Internet search. While you can talk with your child about the reason for the hospital admission, you don't need to offer too many details. Your child does not need to know about things that will take place while they take the special nap (be sure that you never say that they will be put to sleep-especially if you have ever had to put a pet to sleep! ), because they won't be awake to experience them. You can describe that the doctor is going to take a little piece of the muscle so that he/she can find out the best way to help you feel better. For the doctor to get the little piece of muscle, you will need to take a special nap. That will help the doctor to work fast and get just what he/she needs and before you know it, it will be all over. You will probably feel a little sore when you wake up but the nurses can give you medicine for that. You will be back to playing in no time. My JM child will be getting weekly methotrexate injections. She is terrified of needles and I know it is going to be very hard on both of us. Seeing her cry will surely cause me to cry too. Do you have any suggestions or tips? While getting injections is never easy, there are things that you can do to help her get through it more easily. Most importantly, you must maintain a positive attitude when discussing the need for the medication, and the actual injection. Your child will respond in a manner similar to you, so if you act upset, she likely will also. If you do not feel that you can support her during the injection, without becoming emotional, it would be more beneficial for another trusted adult to be there with her. Fear of needles is extremely common. Think about it, has anyone ever said that they love to get shots?! But you or another trusted adult could use distraction techniques to help her through it. You know your child best, so depending on her age, you can do things like blow bubbles or a pinwheel (which helps to relax the muscles), count, sing, play 'I SPY', look at a picture book, listen to music, watch cartoons, or even take an imaginary trip to Disney World. Besides using distraction, it is important to give your child choices. Involving her in her own treatment will help her to feel like she has some control in an out of control situation. When possible, ask her if she wants to help get the medicine out, wipe the area with the alcohol gauze, choose where she wants the injection, watch as the injection is given, etc. Try not to 'warn' your child that she will be getting the injection until a few minutes prior to the actual injection. Telling her too far in advance will only build unnecessary anxiety. Above all, be honest with her. If you try to sneak the injection or mislead her about what is happening, she will lose trust in you and others caring for her. If you must softly restrain her, talk to your child life specialist or nurse about comfort positions that will allow you or another trusted adult to provide the necessary restraint but in a way that also provides comfort to her. If she still cries, that is okay, and you can tell her that it is okay to cry. Crying is an appropriate coping mechanism for children and should be allowed, because she is going through some scary stuff. However, if the crying doesn't stop shortly after the injection is completed or seems to worsen with each injection, you may need to seek help with a psychologist, how can provide further recommendations to reduce the trauma she is experiencing. What are some ways to prepare my child for getting her IV started? IVs can be tough for kiddos, especially kiddos with JM. Sometimes it takes more than one or two tries before the IV goes into the vein. If you are working with a child life specialist, he/she can prepare your child for the IV start through medical play, which often includes showing your child the materials used for the IV start and perhaps even allowing them put a pretend IV into a doll. Even if you aren't working with a child life specialist, you can help prepare your child for the IV start. Ask your nurse about the use of Emla, Elamax or cold spray on the IV site. If your nurse will be using one of these products, be sure to find out how it works so that you can use that information in your explanation to your child. These products can make the IV start much more comfortable, however, they are not always appropriate for every child. Find out when the nurse plans to start the IV and begin to prepare your child no more than 10 minutes before the nurse arrives. If you start too early, your child may become very stressed and anxious. Tell your child that the doctor has asked the nurse to put a tiny straw into the vein so that the medicine needed to help them feel better, can get to all the areas of the body, quickly. The straw is very tiny and soft and gets into the vein with a quick 'stick' or 'poke'. But the straw is the only part that stays in the vein, not the 'poker'. If your child wants to know if a needle is used to get the straw into the vein, be honest with them and tell them yes. However the needle is just used to get the straw in place and it does not stay in the vein. After the IV is in place, the nurse will attach a small tube to the straw and put some cool water into the tube to make sure that the IV is working properly. Then the nurse will tape the straw down so that it stays in place. The medicine will go into the end of the tube after an even longer tube is attached to it. It is important to never, never, never, say, "You’re done!" until after you are 100% sure that the IV is in place and working properly. As I said earlier, it is not uncommon for it to take multiple tries to get it started in kiddos with JM. Again, allow your child to participate and make choices, help them with distraction, and offer them comfort and support. IV starts are tough for everyone, but having lots of hugs can make it easier.